Due to West Steel Sheds' commitment to outstanding service and products they are able to offer the best garage and shed designs with the highest quality workmanship possible. They have also invested heavily in technology and creating systems that ensure accurate and timely delivery of their garages and sheds to their customers wherever in WA you are located. Their computer design programs for the design of sheds and garages are second to none. West Steel Sheds are not a reseller of products. 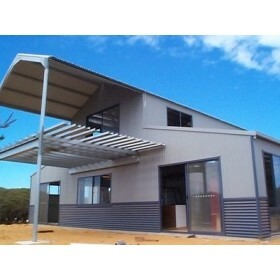 They manufacture and design for construction of the sheds and garages we sell in WA. Their factory is located in Geraldton, WA, with branches throughout regional WA including Geraldton, Port Hedland, Karratha, Exmouth and Kalgoorlie in Western Australia. This means wherever you are located within Western Australia they have a branch near you and can facilitate supply and construction of your new shed or garage. Our experienced team and commitment to customer service ensures you'll receive the service, products and support you expect and deserve.